Viewing political issues from the vantage of design. ❄ Donald Trump Poses an Exigent Threat to the US Polity. What to do? This note begins a response to the question ‘What to do?’ At the moment these paragraphs are place-holders. Still, they remind us that there are multiple measures from which an informed citizenry can draw, suited to successive stages as the emergency develops. There are distinct, dissimilar reasons why any one of us might judge our circumstances to pose an Emergency. I appreciate that for some it is Trump’s failure to sever his private business from his position as President, posing unanswerable problems of motive and trust. There is powerful argument that this Polity must come together, the people unite, in defense of the Polity itself, and some honorably cling to hope that Trump will commit to that unity. To be clear, and to avoid misunderstanding, I consider it a side issue whether Trump’s occupying the Presidency is ‘legitimate’ or ‘illegitimate.’ What most threatens the Polity, in my judgment, is that Trump is unfit, unpredictable, subject to bizarre performances, hence the dangerous occupant of a most powerful and consequential office. Most of the paths below are familiar. However, let me explain CONGRESSIONAL DENIAL. Trump’s authority depends in no small part on the presumption that Republican majorities in the House and Senate will supply him with a compliant Congress. Perhaps they will. It is also possible that strife will reign over relations between Trump and the Republicans. Occasionally commentators note that control of the flow of business in the House and the Senate depends upon the House and Senate leadership being able to call on their membership with a confirmed expectation that their majority will rule. CONGRESSIONAL DENIAL would depend on upsetting that expectation in the Senate. I have chosen to name those legislators who elect to go along with Trump, smooth his road, sit silent, as ‘collaborationists.’ Some may find that uncomfortable, excessive, recalling Europe’s complicated responses to the 1930s. But that is exactly why I choose the term. Traditional China had an expression: ‘the rectification of names.’ If you find the label ‘collaborator’ uncomfortable I suggest you speak up for the Polity and practices that call out for your voice, and by your actions, in the bright light of day, reject collaboration. The Constitution, Article I Section 2, accords the House of Representatives “the sole Power of Impeachment.” If a proposed impeachment reaches the floor of the House it is subject to consideration charge by charge and as a whole, which are put to vote, a simple majority required for passage. In a House of 435 members 218 are required to impeach. Today’s House—that is, that elected on 8 November 2016—consists of 241 Republicans and 194 Democrats. Hence: a Republican move to rid themselves of President Trump by impeachment would go to the Senate even if 17 Republicans voted “no” and all Democrats were uncooperative. A Democratic initiative to impeach Trump would require that all Democrats be joined by 24 Republicans, or more if some Democrats did not join their party colleagues in voting to impeach. In a nutshell, Republicans risk being punished in November 2018 for their opportunism and political incompetence in enabling Trump to become President. They ‘own’ Trump’ the Bizarre. The Democrats, still aflame at the brazen theft of a Supreme Court seat in 2016, have little with which to bargain, apart from their near-majority in the Senate, hope for 2018, and Trump himself. In short, the Vice-President may initiate a claim that the President is disabled, but only if joined by a majority of one or another group of officers, as set out in the text. At that point the Vice-President “shall immediately assume the powers and duties of the office as Acting President.” But the President may insist there is no disability. The remainder of Amendment XXV Section 4 spells out how the difference shall be resolved. The Congress—by a “two-thirds vote of both Houses”—shall have the last word. There are many who believe that Donald Trump was already disabled when he took the Oath of Office. Though characterizations of his circumstances were various, many onlookers believed they discerned a severely handicapped narcissist who appeared unable to distinguish the trivial from the important, affairs of state from affairs of ego, fact from fiction, and who lacked the common regard for others which is a prerequisite for governance. Would Vice-President Pence initiate a claim of disability? That is hard to imagine, given Pence’s role in enabling the Trump campaign at a crucial juncture. It is also hard to see that the required concurrent group of officers could be found. That is: at this writing [23 January 2017] Trump is filling his Cabinet with sycophants and the “other body” referenced in Amendment XXV must be defined “as Congress may by law provide,” that is, a law passed by House and Senate and either signed into law by Donald Trump or created as law by an override of his veto. Far-fetched. the disability clauses of Amendment XXV would pose severe obstacles. It may be difficult, or nearly impossible, to remove Trump from office, but there is another aim by which Congress could respond to the emergency which Trump embodies and presents. I term this the ‘CONGRESSIONAL DENIAL’ option. Trump enjoys a Republican House and Senate. The Republican Party, with the most minimal exceptions, has wrapped itself around Trump’s back insisting there is common cause. But that might not prove to continue to be the case. Trump may reject central Republican policies, or commit outrages which repel the public, or find himself subject to indictment in the Courts. Impeachment requires a majority in the House. But Trump’s capacity to act, and perhaps his willingness to continue to subject himself to the rigors of the Presidency, could be frozen by working together among a very small number of Senators. Picture a bipartisan group of a few Senators profoundly—and patriotically—alarmed at the political disaster unfolding around a recalcitrant Trump. A few Republican Senators, joined by a few Democratic Senators, would propose to caucus with the Democrats on organizational questions. They together with all Senate non-Collaborationists would come into a majority in the Senate. They create the Emergency Committee. Having a majority, they organize the Senate. Mitch McConnell could peaceably retire, the structure of Senate committees would be in the hands of the Emergency Committee, and the calendar of the Senate would also be freed from the Collaborationists. Again, only a few Republican Senators, more if some Democratic Senators rejected the initiative, would be required. Is it crazy to imagine Senators reconstructing the Senate in order to tie Trump’s hands? A similar move has happened in living memory. Recall 24 May 2001. Senator James Jeffords of Vermont, a Republican, found himself uncomfortable with policies of the Republican caucus. He declared himself an Independent, joined the Democratic caucus, and the Democratic Minority Leader of yesterday became the Majority Leader of the Senate today. Overnight. The Senate had been so evenly divided that the move by one Senator was sufficient to replace Republican control by Democratic control. The question is ‘how could an ad hoc Emergency Committee constrain a President wielding all the authority of the Executive Branch?’ It could agree to block judicial appointments, including appointments to the Supreme Court, that the Emergency Committee did not approve … bulwarked by an understanding that the Emergency Committee would be sworn to balanced recruitment to the Courts. It could agree to withhold appropriations from Executive initiatives that were not bilaterally approved. In doing so it would be leveraging the Constitutional rule that no monies may be spent by the United States of America without lawful authority and that all Appropriations measures much originate in the House. It could withhold consent from any legislation sought by the White House to enhance, or refine, Executive authority. In November 2018, when a third of Senate seats and all House seats are subject to election, the citizenry could deny election to any political figures declining to distance themselves from Trump. They could even deny seats to candidates failing to follow the lead of the Emergency Committee. Whatever one’s view of the paths outlined above, there is one path which should be undertaken and which merits cleanly bipartisan support. This is the initiative to ensure that the Presidential candidate obtaining the most votes be guaranteed, by that fact, election by the Electoral College. As designed this procedure could be brought into effect without any wrenching changes in the Electoral College as it now exists, nor would it require any Constitutional amendment. The proposal is well-designed and already has the formal complete endorsement of eleven States. What is this magical solution to the Electoral College Problem and how can one learn more about it? which means in part that two or more States may “enter into [an] Agreement or Compact” between or among themselves for any purpose not explicitly excluded. They must, however, obtain Congressional assent. As this is a post-Trump proposal, without any implications for Trump’s current status, there should in principle be no objection to this proposal from the Congress or the White House. ❄ Is The Response to Climate Change Sufficient? How can citizens judge whether responses to climate change are sufficient? What is the response to climate change? Starting from scratch, how could I find out how climate change is being measured, and what specialists say about response? If I were fashioning a response, what policies and practices would I commend, and what present-day practices shun? And what of claims for urgence? That is, does evidence I credit confirm the case for prompt, extensive change in policy and practice? Almost all well-informed climate scientists and policy scholars judge that climate change poses an urgent issue. Among them are some who have committed their time and effort to raising an alarm, alerting the public, calling for government action and changed economic practices. Some emphasize ongoing change, and change that is foreseen, to show how much is at stake. ➀ Alex Steffens blog: The One Number You Need to Know. ➁ The Global Carbon Project: Carbon Neutral and other pages, for example, the Global Carbon Atlas. ➃ James Hansen, Makiko Sato, Pushker Kharecha, David Beerling, Valerie Masson-Delmotte, Mark Pagani, Maureen Raymo, Dana L. Royer, James C. Zachos8, 2008:Target Atmospheric CO2: Where Should Humanity Aim? originally published in Open Atmos. Sci. J., 2, 217-231, doi:10.2174/1874282300802010217. ➄ CO2Now.org. Stabilizing Climate Requires Near-Zero Emissions. Reposted from ScienceDaily (Feb. 18, 2008). There have been successive efforts to design, describe, explain, and use hypothetical constructions of possible energy and climate futures. The Intergovernmental Panel on Climate Change is now in its 5th iteration of reviewing evidence and interpreting it to the world. In parallel, three Working Groups have undertaken to present their judgments of the probability that salient effects will occur, or could be brought to occur. The Working Groups (labelled WGI, WGII and WGIII) deal, respectively, with the physical basis, effects in the world, and possible mitigations. Each Working Group has produced, or shortly will, two papers, a long-form study and a short Summary for Policymakers. where ar5 means the 5th Assessment Report. URLs for the Summaries are given below. ❄ Maintaining Humanitys Life Support Systems in the 21st Century: Information for Policymakers. The Wikipedia process is well-suited to transparent drafting. An example illustrating what can be done is the ❄ Wikipedia article on ‘radiative forcing’. Even well-read members of the public are unlikely to be familiar with the phrase, but its use runs through IPCC documents. Whether the response is sufficient will depend not only on how greenhouse gases make for warming, but also on the quantities of greenhouse gases in the atmosphere. In turn, that will depend in large part on the quantities of fossil fuels (coal, oil, natural gas) that emit CO2 into the atmosphere when burnt. Where could one look for ‘up to date’ estimates of emissions? The successive Assessment Reports incorporate recent work to measure emissions. But what if you wanted to compare the historical estimates with those for the most recent year? ❄ The Global Carbon Project, mentioned above, produces annual estimates. The 2013 estimates were published on 19 November 2013. 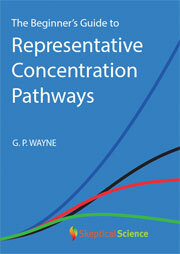 In the next section we will consider the disciplined speculations known as Representative Concentration Pathways (RFCs). Assumptions—about energy demand, technologies, policy response—underlie each of them. For example, the stability paths anticipate that carbon capture and sequestration (CCS) will become practical and widely practiced … enabling economies to rely on fossil fuel and biofuels while avoiding todays levels of greenhouse gas emission. But will these expectations prove sound? Another example: some say the solution to global warming lies in nuclear power … but does the world have the engineering capacity to build that many nuclear reactors? And would doing so be wise—given environmental risk and threat of weapons proliferation? IPCC, 2013: Summary for Policymakers. In: Climate Change 2013: The Physical Science Basis. Contribution of Working Group I to the Fifth Assessment Report of the Intergovernmental Panel on Climate Change [Stocker, T.F., D. Qin, G.-K. Plattner, M. Tignor, S. K. Allen, J. Boschung, A. Nauels, Y. Xia, V. Bex and P.M. Midgley (eds.)]. Cambridge University Press, Cambridge, United Kingdom and New York, NY, USA. Page 9. IPCC, 2014: Summary for policymakers. In: Climate Change 2014: Impacts, Adaptation, and Vulnerability. P.R. Mastrandrea, and L.L. White (eds.)]. Cambridge University Press, Cambridge, United Kingdom and New York, NY, USA, pp. 1-32. INDEX. Journal of Denuclearization Design. INDEX. The Journal of Denuclearization Design is a cumulative digital only journal edited and issued by the Global Collaborative on Denuclearization Design. Access to the Journal is at the GC.DD website: www.gcdd.net. Please direct correspondence and submissions to editor@gcdd.net. The red page numbers are hot links. I:1-13 The Nuclearist Codex at the Onset of the Obama Era. Bruce D. Larkin. 31 October 2008. II:1-14 What Would Nuclear Abolition Look Like? III:1-19 Have We Forgotten the Maginot Line? Bruce D. Larkin. 28 July 2009. Additions and revisions 20 November 2011. Bruce D. Larkin. 18 November 2009. Additions and revisions 3 January 2010. V:1-22 Studying the 2010 Nuclear Posture Review: Ridding the World of Nuclear Weapons? Bruce D. Larkin. 13 April 2010. Bruce D. Larkin. 9 January 2011. Revised 11 February 2011. VII:1-23 ZNW in Global Priorities: How Does Nuclear Weapons Abolition Fit Among Global Priorities? Bruce D. Larkin. 11 February 2011. Bruce D. Larkin. 31 March 2014. Bruce D. Larkin. 10 December 2008. 4 June 2009, 15 June 2009, 2 February 2010, 21 February 2010, 14 January 2011, 8 March 2011. ONE :1-11 Note One. Does an Indian Uranium Scarcity Reinforce Critics of the US-India 123 Agreement? Bruce D. Larkin. 7 February 2011. Bruce D. Larkin. 11 December 2013. The Journal of Denuclearization Design is a cumulative digital-only journal edited and issued by the Global Collaborative on Denuclearization Design. It is a vehicle for studies undertaken by the Global Collaborative and germane articles submitted by others. Access to the Journal is at the GC.DD website: www.gcdd.net. Please direct correspondence and submissions to editor@gcdd.net. met by including this page as the last page of the article. Ima N. Author is Assistant Professor of Public Policy at the University of the Wilderness Profound, where she specializes in the intersection of energy supply and security. Ive posted a draft paper Designing Against Surveillance. It begins by focusing on three blunders by which, in my view, the US Government has struck at the Net itself. • NSA has actively worked to weaken, and evade, widely-used tools for encryption. and then continues with a broader critique of US Government practices … and some measures that could be taken in response. ❄ A Framework to Contain Surveillance? Earlier suspicions confirmed … and then some. Metadata and content. Telephone calls. Postal mail. eMail. Fiber optic streams. Internet. Web. VOIP. NSA. GCHQ. Targets. Collection. Acquiring. Retention. PRISM. UPSTREAM. These several rights stake out protections against the imagined—and amply experienced—raw power of the State. The State could flog, imprison, torture, and kill; could seize property; could consign to battle; could condemn as heretical or treasonous. That there had come to be normative limits on the State was the result of long struggle. The revelations of mid-2013 present a problem that is not new in kind, but is recently transformed by the scale, scope, and means of intrusion that current digital technology presents. Now the State can see and hear not all but enough of what people utter to one another, identified as the work of named speakers and writers, that it could hold people accountable, at some future time, for their expressed thoughts. Or, more quietly, it could channel access to work and privilege to those whose ideas were acceptable while systematically denying access to those whose ideas were shunned. The possibilities for corruption, for injustice, for abuse are clear. Just as having nuclear weapons requires that Government judge them managable, so building a surveillance state requires Government to judge that it can control its  security apparatus. But will it prove able to do so? Can it be sure that no one person, no Party, no Corporation, will twist the power of secret knowledge into the fatal distortion of the political system? Can it be sure to be proof against authoritarianism, one-party rule, the police state? Have Americans forgotten J. Edgar Hoover? No question that the US surveillance system incorporates rules and checks against misuse of the powers invested in it. We are assured that the number of instances in which rules are broken is vanishingly few, by comparison to the total number of transactions with which the National Security Agency and its confrères deal. Nor can it be denied that electronic surveillance—including the storage and querying of vast datafiles recording the activities of the people—can be usefully invoked in combating crime and regulating the border. Assume that both public and private (corporate, market, journalistic, political) data collection will continue. It will be increasingly easy to connect data to specific men and women. Almost everyone could be the subject of a profile. Can effects of surveillance be contained? Database Registry. Would it help to require that any database containing names, addresses, telephone numbers, email addresses, or that could be linked by a common column of data to another database (with names, numbers) be registered? On the one hand, to do so makes it possible to assess vulnerabilities and enforce rules. On the other hand, such a registry would be a handy first-step for anyone seeking to enrich individual profiles. Dossier Access. Could I have the right to demand a printout of all data about me, wherever held? In practice, could such a dossier be collected and passed to me? Dossier Challenge. Could a procedure be put in place by which I could challenge as false or mistaken an entry in my dossier? Would the number of challenges overwhelm custodians? Forbid Private Databases. While it is hard to imagine the State functioning without extensive personal databases (Social Security, driver’s licenses), or a modern society without digital means to carry on and store financial transactions, could a way be found to segregate content from identifying markers (names, numbers)? And so make possible barring private databases that included entries tracable to named people, their addresses, &c.? Forbid Bulk Collection of Transactions, Both Content and Metadata. Entertain the proposition that instead of collecting data on all and then querying the data to develop leads, police and security personnel would instead make out an old-fashioned case, before a judge, for a warrant. That is: return to the Fourth Amendment. Require an Individual Warrant to Undertake a Search or Seizure. Drawing from the Fourth Amendment language, require a showing of probable cause and particularly describing the place to be searched, and the persons or things to be seized. All Warrant Requests Declared and Contestable. We can think of two classes of warrants: one to openly seek evidence pertaining to an individual who understands she or he is suspected of having committed a crime, the second to exploit the advantage of secrecy (by tapping a phone, intercepting email, or entering premises clandestinely) to develop evidence to lead to an arrest. What would change if the FBI, for example, had to announce its intention to seek a warrant before entering premises? What would change if the FBI did not have access to all email passing through the United States? This is a post in process, to which I may make additions and changes in future. Please cite this by its last revision date: ❄ Syria 2013.09.01.1004. Civil war has now raged in Syria for more than two years. The Syrian civil war poses a classic problem to outsiders: whether to intervene. A government battling insurgents presents outsiders with the most acute forms of this problem if (i) it attacks its own people—including or especially non-combattants, or (ii) the war risks use of forbidden classes of weapons: chemical, biological, nuclear. The problem is still more acute if forbidden weapons could leak to trouble-makers in other countries. Is there any intervention that (i) would helpfully address the problems of Syrian civilian security, (ii) enforce, or reenforce, the norm against forbidden weapons, (iii) meet the test of serving the national interest of the intervenor(s), and (iv) not make matters worse. As to (iv), what are the risks that the intervention would have unintended consequences which, in retrospect, would have weighed against a decision to intervene? Syria. Beyond the P5 meeting in NY, I would wish there were a small group of US and Russian analysts tasked to sort [a] agreed claims (call them ‘facts’) and [b] with text explaining reasons, claims not agreed, [c] assembled using all means at their disposal. Aim: to supply Putin & Obama with possible paths to joint response. ❄ Design a Simple Tax System? This post is prompted by the current Irish conundrum. In 2008 the Irish government of the time—since repudiated—made the colossal mistake of committing to back all deposits and debts of Irelands banks. Deposits: fine. But money borrowed by the banks from elsewhere (such as German banks), then lent to fantasists, and by them squandered on projects steeped in risk: no. So sovereign Ireland was bailed out. It finds itself with massive obligations and its economic policy subject to the requirements of the troika (European Union, European Central Bank, and International Monetary Fund). To work its way out it must cut government spending and increase government revenue. The Irish public already pays taxes, but because so many are out of work and so many businesses in difficulty, revenue from existing taxes is insufficient. Tax revenue can be increased by fostering activity that increases the tax yield, raising existing tax rates (provided that doing so does not cause people to flee from the activity taxed), or by instituting new taxes. The IMF observed that other advanced countries collect property taxes and is pressing Ireland to do so, at a suggested rate of half of one percent of value per year. A homeowner whose house was valued at €200,000 would pay €1000. Irish government ministers have said thats too much and have floated a quarter of one percent as a possible tax. No one knows what the market value of Irish residential and commercial property might be, since until recently rectified there was no public record of the transaction price when property changed hands. The price was a secret. Buyers were at the mercy of sellers and—it has to be said—property agents. In Irelands circumstances, does levying a property tax make sense? If it does, how would property be valued and the tax collected? And more broadly, what changes in Irish taxes would do the job, with the least unacceptable bad consequences for its citizens and social life? One approach is to avoid property taxes altogether. The problem is that already-tapped sources, with one exception, are already taxed high. Typical sources are income, auto (registration and initial fee), goods and services (VAT or sales tax), capital gains, and fees for specific purposes (health, education, water, television). In many countries, wealth and property are taxed. But Irish income tax is already high; VAT can run to 23%; the initial auto registration fee would be thought prohibitive in many countries; and families typically contribute to the costs of K-16+ education. On the other hand, Ireland has attracted foreign companies by charging only 12.5% tax on corporate profits. A second approach would tax residential and commercial property. Taxing commercial property would undermine the intent in charging only 12.5% on profits. Turning to residences—which Ireland already divides into principal residences and non-principal personal residences, imposing a modest fee on the latter (second homes and investment properties), we meet the obstacle that there is no register of house values. Moreover, prices in and near Dublin are high while those in the most rural areas distant from Dublin are low The talk is of self-assessment, which opens the door to undervaluation and a nightmare of enforcement. Or Ireland could pay an army of assessors to look at every home in the state. Ive been told that combining self-assessment with an adjustment when the property was next actually sold would solve the knot of valuation, truth-telling, enforcement, and collection. This way: under-assess, and you will need to pay more, with interest and penalties, when you go to market and sell. A very different approach was offered by Nicholas Grubb in a letter to the Irish Times. [Note 2] Simply apply, he recommends, a levy to the utilities, water/sewage, oil, gas and electricity. The larger the property or the more persons using it, the higher the take. He points out that this would provide a built-in inducement to be frugal in using utilities, consistent with European and Irish environmental obligations. Households are already billed by utilities; moreover, households could anticipate and control their costs. By contrast, a scheme that brought in market value some years hence would put homeowners in uncertainty about how much their resultant levy might be. that is, its utility lies in the holders believing that he or she will be able to convert it to goods or services in the future … of type and quantity that justifies electing to save now and postpone consumption. that is, it is purely a matter of political choice where and how much tax will be levied. Usually it is at either (i) a point in a transaction convenient for collection or (ii) where money is at rest. VAT, taxes on financial transfers (as some propose), and an estate tax all take from the stream of transactions. A wealth tax or property tax takes from value at rest. fair may mean that the reasons for the tax make sense to taxpayers, and that the tax is designed to be applied equitably (within the conditions given in imposing it). which does not mean that their recipients should be the only ones to contribute to them, since almost all public services contribute to stable expectations, are dormant benefits for those who may later call on them, and have indirect benefits to all. Consider the degree to which non-users, or those not users today, benefit from highways and airports, medical services, schools, public sanitation, and utilities. that is, if households are overwhelmed by the combined effects of income tax, property tax, motor tax, school-related costs and fees for services—and for many the crushing effects of job loss—they will simply be forced to forego some purchases and activities and in turn state revenue will be lost. Im reminded of a proposal drafted by the economist Thomas Balogh in response to a request from the government of India. [Note 1] As I recall it, Balogh proposed a tightly interconnected tax system based on tracking income, expenditure and wealth, but applying only to the richest 2% in India. Picture it this way. You begin the tax year with a declared wealth (say, bank deposits). During the year you earn some income. You must declare that income because the firm or person paying you will declare it as an expense. The numbers must match. Moreover, the firm or individual employer has a strong incentive to declare expenditures, because otherwise he will appear to have income not offset by expenditure, to be added to wealth. Each—income, expenditure, wealth— could be taxed, but in Baloghs proposal money held in bank accounts that the bank could in turn lend to promote entrepreneurial activity or economic development would not be taxed. So the best thing for everyone in Balogh’s world is to report income, report expenditure, and save liquid wealth in accounts enabling lending for Indias economic development. A virtue of Grubbs proposal is that moneys invested in maintenance of a residential property are not directly taxed, so the incentive remains for a family to enhance their home and its value. [Note 1] I havent been able to find a copy of Baloghs report. I read it more than 50 years ago, so my summary could be a bit off-center. Id appreciate anyone who has the citation posting it in a comment. [Note 2] Nicholas Grubb, Letter, Coming to terms with property tax, Irish Times, 2012.09.14. China and Japan are embroiled in a territorial dispute about sovereignty over the Diaoyutai (Chinese: 钓鱼台) or Senkaku Rettō (Japanese: 尖閣列島). How could this dispute be reconciled? Is there any path that could, additionally, provide a model for the management of similar disputes in future? The classic method of solving such disputes is to submit to mediation or, should that fail, to simple arbitration or to binding arbitration. These methods are widely used in other contexts and often prove successful. In mediation, a disinterested party assists the disputants in finding common ground and a solution. An arbitrator, or a panel of arbitrators, defines a solution; but it then remains for the disputants to decide whether they shall accept the result of arbitration. Binding arbitration requires the disputants to have agreed, before arbitration begins, that they will be bound by the result. The ups and downs by which successive efforts can lead, despite setbacks, to a conclusive settlement is illustrated by the Beagle Channel dispute between Argentina and Chile. Arvid Pardo was one of the first three staff members of the United Nations, upon its formation in 1945. He was later Maltese ambassador, and has been called father of the UN Convention on the Law of the Sea. Hence I propose this be named Arvid Pardo International Park. Are the political and social worlds the result of cultural and social forces or of peoples intentional actions? If you were asked to explain the following verbatim claims about the United States—are they true? how are they possible? what do they mean? how should citizens respond?— what would you say? [I]n percentage terms, the bursting of the housing market bubble in 2006 and the recession that followed from late 2007 to mid-2009 took a far greater toll on the wealth of minorities than whites. From 2005 to 2009, inflation-adjusted median wealth fell by 66% among Hispanic households and 53% among black households, compared with just 16% among white households. The Bureau of Justice Statistics [US Department of Justice], after studying partial data on state-court felony prosecutions nationwide, found that from 1986 to 2006 the ratio of pleas to trials nearly doubled. The shift has been clearer in federal district courts. After tougher sentencing laws were enacted in the 1980s, the percentage of criminal cases taken to trial fell to less than 3 percent last year, from almost 15 percent, according to data from the State University at Albany’s Sourcebook of Criminal Justice Statistics. The explosion of immigration prosecutions, where trials are rare, skews the numbers, but the trend is evident even when those cases are not included. Were these outcomes the consequence of impersonal cultural and social forces, or of choices made by groups and individuals in the US community? forces or choices? The New York Times, 6 June 2012. [Note 2]: Erica Goode, Average Prison Stay Grew 36 Percent in Two Decades, The New York Times, 9 July 2012. [Note 3]: David Remnick, The New Yorker, 12 March 2012. [Note 6]: Richard A. Oppel, Jr., Sentencing Shift Gives New Leverage to Prosecutors, The New York Times, 25 September 2011. Mark Green and Gary Hart have published an Open Letter to 10 Congressional Leaders signed by 20 leading Democrats. [Note 1] The relevance to political design lies in their brief list of prime proposals, several of which have been the subject of previous posts to Political Design.  Ideas … Where are the successors to Social Security, GI Bill, the Americans with Disabilities Act? To help Democrats win and govern, what can be our positive mandate? … We can do that here on earth with a living wage, a carbon tax, a Mortgage Refinancing Trust agency, progressive tax reform, filibuster reform, corporate pension reform, public funding for public elections, universal voter enrollment – and with clear explanations how inequality retards the GDP, education investments advance growth, and a high-tech Pentagon can be smaller and more effective. [Note 1] Text of letter at http://www.huffingtonpost.com/mark-green/dnc-democrats-open-letter_b_1852899.html. Huffington Post, 4 September 2012. … we could adopt a system of small-dollar public funding for Congress. Lessigs option addresses the supply question. [Candidates declining the terms for democracy vouchers risk being penalized at the polls.] But it doesnt deal with the demand problem. Candidates would still need money—and loophole-exploiting friends or issue-focused fronts—to compete. So: good as far as it goes. The next question. How could we, following Lessigs spirit, wholly suppress big money? [Note 1]: Lawrence Lessig, More Money Can Beat Big Money, The New York Times, 17 November 2011.
admin on ❄ A 2001-2009 Truth Commission? Anonymous on ❄ End the Plutocracy? Prof Betty in Maine on ❄ A 2001-2009 Truth Commission? Queale on ❄ Iran [II]: Use of Force?